Ghost costumes are classic. No one will have to ask you what you are on Halloween. The costume is simple to make and fits almost anyone. Be careful though! 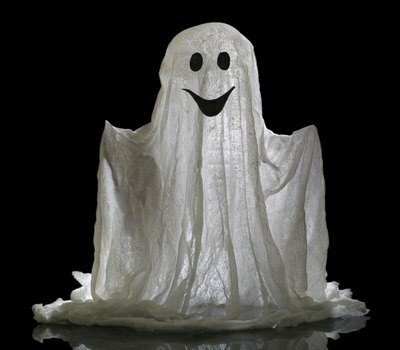 Ghost costumes are easy to trip on and limit your peripheral vision, so they are best for people over 8 years of age. Be extra cautious while climbing stairs or crossing the street while wearing this costume. Drape the sheet over the head of the person who will wear the costume. Make sure it is centered -- the front should not be longer than the back. If any part of the sheet is dragging on the ground, mark lines across the parts that are dragging so you can cut them off after measuring the rest of the sheet. Have the wearer poke the sheet out where her eyes are located. Draw two dots on the sheet to make the eye location. If he would like a mouth hole, have the person poke his fingers out at the edges of his lips and draw two dots where his fingers are behind the sheet. Remove the sheet. Draw two dark circles about 2 inches in diameter around the dots where the eye holes will be. Cut out the eyes. If the person would like a mouth hole, cut out a thin slit between the two dots you made on the sheet indicating mouth location. Cut off the bottom edges of the sheet if you marked areas that were too long. Apply the eye makeup. Gently dab black face paint with a sponge underneath and above the eyes. The paint should extend 1 1/2 inches in diameter below and above the eyelids. Put the sheet back over the person's head, making sure it is centered so the person can see out of the eye holes. If the costume-wearer would like to look like a ghost without the sheet, give her a ghostly hairstyle by turning her hair white with chalk. First, wet the person's hair so the color will attach to it. Run a white piece of artist's chalk down the person's hair in 1-inch sections, twisting the hair as you go. You can either make ghostly white highlights or color the entire head of hair. If you choose to color all of the person's hair, you will need two pieces of artist's chalk instead of one. After the person's hair has dried, apply hairspray to keep the color from coming off. To make your ghost costume spookier, carry glow lights underneath the sheet to create a ghostly light or wrap chains around your chest. To make your ghost costume sillier, add accessories like a flower lei around your neck or pair of Groucho Marx glasses on your face.